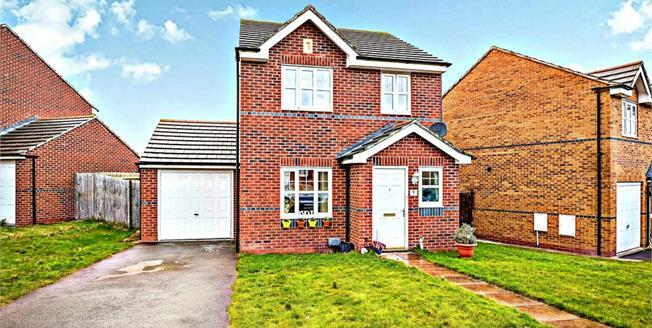 Early inspection is highly advised; to fully appreciate this modern three bedroom detached property situated in a quiet cul-de-sac within a popular residential development. Tastefully decorated and lovingly maintained throughout, this property presents a fantastic opportunity for any family. In brief, the spacious ground floor accommodation comprises; entrance hall, cloakroom/WC, lounge, and modern fitted kitchen/diner overlooking the generously-sized rear garden which is mainly laid to lawn complete with sunny patio area. To the first floor, there is a master bedroom benefitting from an en-suite shower room, two further bedrooms and a family bathroom. Additionally, this beautiful property boasts gas central heating, double glazing, off-road parking and a garage. Book your viewing via our Prenton Sales Office on 0151 608 8589. CLOAKROOM/WC 5' 4" x 3' 1" (1.64m x 0.95m) Vinyl flooring, ceiling light, Upvc double glazed window facing front, low level WC, wall mounted hand basin, radiator. KITCHEN/DINER 10' 5" x 16' 0" (3.19m x 4.90m) Modern fitted kitchen with a range of wall and base units complete with complementary work surfaces, stainless steel inset sink with drainer and mixer tap, integrated gas hob, electric oven, extractor fan, Upvc double glazed window facing rear. Upvc double glazed French doors opening onto patio. LANDING Carpet, ceiling light, Upvc double glazed window facing side, access to bathroom and all three bedrooms. BEDROOM ONE 13' 8" x 9' 5" (4.18m x 02.89m) Max Carpet, ceiling light, Upvc double glazed window facing front, access to en suite. BEDROOM TWO 11' 3" x 9' 5" (3.43m x 2.89m) Carpet, ceiling light, radiator, Upvc double glazed window facing rear. BEDROOM THREE 7' 10" x 6' 3" (2.41m x 1.91m) Carpet, ceiling light, radiator, Upvc double glazed window facing front. BATHROOM 7' 10" x 6' 3" (2.41m x 1.91m) Vinyl flooring, ceiling light, radiator, panelled bath with shower above, low level WC, pedestal sink, Upvc double glazed window facing rear. EXTERNAL Rear garden mainly laid to lawn with patio area and perimeter fencing. Garage with up and over door, Driveway to the front providing off-road parking.